What is a cat-back exhaust system? There are seemingly endless available upgrades when looking to enhance vehicle performance. It certainly rings true when it comes to your vehicle’s exhaust system. One term that you’ve probably heard if you’re in the market for an aftermarket exhaust upgrades is cat-back exhaust. What exactly does it mean, and how does it change the way your vehicle performs? Read on to gain insights into cat-back exhaust systems. Cat-back exhaust refers to any part of the exhaust system that’s behind the catalytic converter. 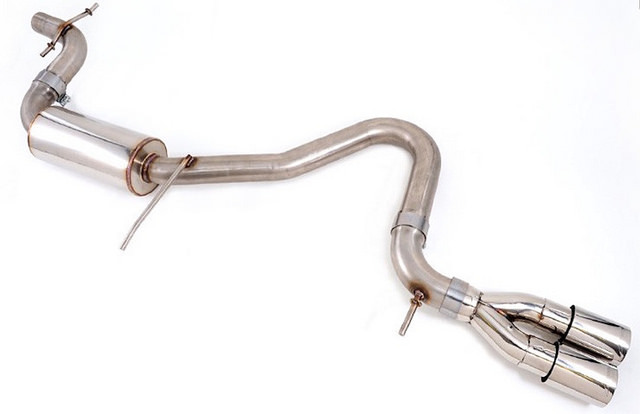 Typically, this includes the pipe connecting the pipe from the catalytic converter to the muffler, the muffler, and the tailpipe or exhaust tips. When used in the context of aftermarket parts or performance upgrades, “cat-back” is used to indicate which section of the exhaust system the parts replace. Cat-back systems are available as both single- and dual-exhaust. Why consider cat-back exhaust upgrades? Aftermarket cat-back exhaust upgrades are a relatively simple way to increase your vehicle’s power. Typically these upgrades involve installing wider piping with fewer sharp or sudden bends as a way to reduce backpressure. Backpressure is pressure opposing the desired flow of exhaust gasses. The more you are able to reduce backpressure, the more efficient the system will be, and ultimately your horsepower will increase. Typically a cat-back exhaust upgrade can be swapped with the original exhaust without any modifications. As an added bonus, cat-back systems include all of the necessary parts to replace your existing exhaust. The only costs you need to worry about are the kit itself and installation. Park Muffler specializes in custom and high-performance mufflers and exhaust systems. Our technicians can help you make the best decision about what system upgrades will give you your desired results. For any and all questions related to exhaust performance and upgrades, contact the experts at Park Muffler today!